Things start to heat up in Saga #35 as the collision course hinted at in the previous issue is developed further. This is the penultimate issue of the current arc, and it does feel like there will be a big payoff in the next chapter. Saga #35 nicely juggles a number of characters, but they have been so well established over the past few years by Brian K. Vaughan and Fiona Staples that it allows the narrative to move well while still serving character. In Saga #35, Klara (Marko’s mother), who has become a leader of prisoners, finds out about Noreen’s plan to help Hazel escape. Although Klara is wary of the danger, she realizes that Hazel is also threatened while locked up. Alana and Marko have teamed up with a reticent former-Prince Robot IV to try to get to the prison where Hazel and Klara are being held. Meanwhile, The Will uses the reporters Upsher and Doff, whom he kidnapped, to find out the location of Prince Robot, whom he wants to kill because he murdered The Stalk. The Will finds Squire, the Robot’s son, but the issue ends with Ghus showing up to defend Squire. 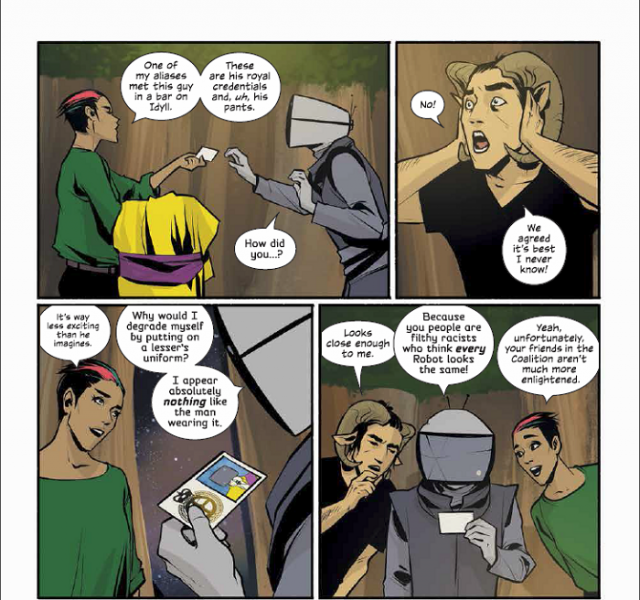 As with the last issue, there is a lot that happens in the plot of Saga #35. That’s what happens when you have three plots moving concurrently. In many stories or TV series, that much action comes at the expense of character moments. However, Vaughan and Staples supply numerous strong character instances. We see how prison has changed Klara while Noreen continues to demonstrate her bravery. The Will, who is haunted by visions of The Stalk, seems to be increasingly unstable, which also makes him rather unpredictable. Perhaps the best moments belong to Robot IV, who has often been a curmudgeon. In Saga #35, we get moments of his deadpan humor and also brief glimpses of legitimate empathy from the Robot. The issue moves at a brisk pace, but it’s still clear that these are the characters that readers have come to enjoy in Saga. I would be remiss if I didn’t mention an important development that occurs in Saga #35 – the semi-return of a beloved character: Lying Cat. Zlote, a source Doff calls to get info about Robot IV, appears to be some sort of drug-fueled space promoter/producer. Somehow, though, he has possession of The Lying Cat, complete in a crown and coat with fur collar. It’s a wonderful moment because The Lying Cat has been missing since Saga jumped forward in time. It’s also interesting because Zlote never specifies that info to Doff, meaning that The Will does not know that his former partner is with Zlote. So while it was great to see The Lying Cat, it might not mean that the character will now be around frequently. This seems more of a seed laid for future storylines. 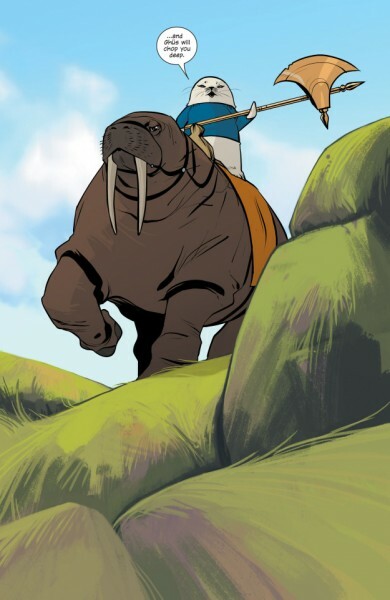 I mentioned in my review for Saga #34 how Fiona Staples has done a nice job of updating and subtly changing character appearances to highlight a sense of realism and also show the passage of time. There are a number of additional instances in this issue as well. The cover amusingly shows Klara receiving prison tattoos, and this is not some false tease (as with many comic book covers). She has numerous new tattoos, including a small dagger below her eye. This is a nice symbolic move to show the changes to her character. Prison seems to have changed Hazel a bit, but it may have affected Klara even more. Another small difference is with Lying Cat, who has usually appeared fierce. In the short scene, Lying Cat appears more domestic and even cute, perhaps demonstrates that this character has also been changed in certain (yet undefined) ways. I think the current arc of Saga has been very strong (with the exception of the Upsher-Doff issue #33, which was okay). Vaughan and Staples have succeeded where many serialized fiction series have failed – giving real challenges and obstacles that characters have to pursue and overcome to move the plot. Saga #35 also shows that the series hasn’t abandoned character details even when the plot moves swiftly. The next issue, the last in the arc, portends some big events coming, as the three groups seem to be heading towards each other. The return of Lying Cat!